Livia Sferra first appears at Painesville, Lake County, Ohio, in 1936. She moved to Painesville, Ohio, after she married Painesville resident Felicantonio Cardegna. In America, Livia Sferra was known as Livia Sferra, then, after she married, she was known by her married name, Livia Cardina. Livia Sferra, daughter of Francesco Sferra and Angelina Conti, was born on May 3, 1909, at Carovilli, Isernia Province, Molise, Italy. Livia married Felicantonio Cardegna, son of Michele Arcangelo Cardegna and Maria Orazia Gentile, on June 6, 1936, at Peninsula, Summit County, Ohio. Felicantonio Caregna was born at Frosolone, Isernia Province, Molise, Italy. 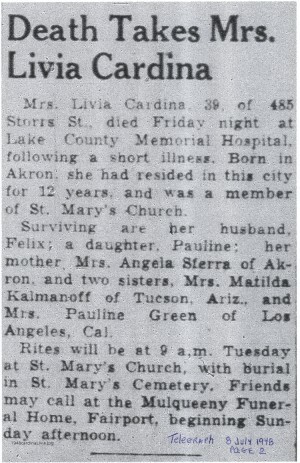 Livia Sferra died on July 2, 1948, at Lake County Memorial Hospital, Painesville, Lake County, Ohio, of pulmonary edema. Her body was interred at St. Mary Cemetery, Painesville Township, Lake County, Ohio. Livia Sferra immigrated to the United States on September 5, 1912, at age 3. She was travelling to Akron, Summit County, Ohio. Livia immigrated with her parents and sister, Pauline Sferra. The family arrived in the United States at the Port of New York City aboard the ship SS Prinzess Irene. Livia Sferra was enumerated for the 1920 Census of the United State living at Akron, Summit County, Ohio, as a daughter of Francesco Sferra. Livia Sferra was enumerated as Levia Sferra. Livia Sferra was enumerated for the 1930 Census of the United States living at Akron, Summit County, Ohio, as a daughter of Francesco Sferra. Livia Sferra was enumerated as Livia Sferra. Livia Sferra was enumerated for the 1940 Census of the United States, on April 9, 1940, living at 483 Storrs Street, Painesville, Lake County, Ohio, as a daughter-in-law of Michele Arcangelo Cardegna. Livia Sferra was enumerated as Livia P. Cardina. At the time of death, Livia resided at 458 Storr Street, Painesville, Lake County, Ohio.